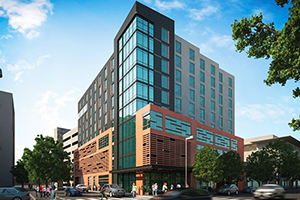 The Draftsman Hotel in Charlottesville is expected to open in spring 2018. The outlook for lodging remains favorable in Virginia with many new hotels in the pipeline. In fact, demand for hotels is outpacing supply throughout most of the commonwealth, according to recent reports from STR and CBRE, two companies that track hotel industry data. Two of Virginia’s hotel markets — Norfolk/Virginia Beach and the Washington, D.C., metro area — were among North America’s top markets in 2017 in terms of revenue per available room (RevPar). According to STR, Norfolk/Virginia Beach saw a 6.9 percent increase while the Washington metro area got a 5.2 percent boost. Virginia’s overall hotel occupancy rate was 64 percent at the end of the third quarter of 2017, and the average daily rate per room was $109. Both figures are slightly below national averages of 65.9 percent and $129.94, respectively. Currently, Virginia has about 24 projects under construction, which would add 2,723 rooms. In the final planning stages are another 73 projects that, if built, would bump the total of new rooms coming online in the near future to 10,556, according to STR. Charlottesville, Richmond and Lynchburg are the cities with the most hotel rooms in the pipeline. Autograph Collection The Draftsman, Charlottesville, 150 rooms.